Real Simple Best Recipes Cookbook Giveaway! In anticipation of their 10-year anniversary, Real Simple just released a new cookbook, Real Simple Best Recipes. They graciously sent me an advance review copy and it was love at first sight. The book is full of wonderful, SIMPLE (go figure), delicious-looking recipes. And every recipe has a beautiful photo, a cookbook characteristic that is important to me. I know you’re chomping at the bit to get your hands on this cookbook. Now’s your chance! You can buy it here…and of course we have a giveaway right here on This Week for Dinner! Real Simple is giving away TWO copies of Real Simple Best Recipes. Just add a comment to this post by Midnight PT on Monday, November 9 and you could be one of two lucky winners to each receive your very own copy! The randomly-selected winners will be announced on Tuesday, November 10. I love Real Simple! And I could really use a new cook book. All of mine have been over used and abused. Pick me! Pick me! I love Real Simple and I’m in need of a good source for quick recipes. I have made a commitment to try new recipes at least once a week to mix up our go-to meals. Real Simple is definitely a place I go to for inspiration and would love to expand my cookbook collection – it is actually kind of sad looking! Wishing that one day I’ll actually win one of these!!! I would LOVE this cookbook!! I love yummy, simple recipes with lots of photos! real simple recipes are my favorite. they always work and they are always delicious. fingers crossed that i win!! thanks! Oh! Ooooh! Pick me! Nothing better than a cookbook! I need a new cookbook!! Please oh please!!! I LOVE Real Simple! I love Real Simple, thanks for the great giveaway. I am a devoted Real Simple reader. I love their other cookbook and would LOVE to add this cookbook to my collection. I need to start cooking more, and I think this book would help! Ohhhh, what’s that on the cover? Looks good enough to EAT! Can you send someone to make the recipes too? I’m feeling lazy. Cool! I love Real Simple and cookbooks! Real Simple is, hands down, my favorite all time magazine. There is no other magazine that I read cover-to-cover. I regularly use several of their recipes and have become family favorites. I’m soo excited to find out this cookbook is coming!!!! How fun to actually win it!!! Love Real Simple, would love their cookbook. Thanks for the giveaway! I would love a copy! I love recipe books, and have never heard of this one. What an awesome giveaway! I love cookbooks and I love Real Simple, so it sounds perfect! I would love this, Jane! In fact if I don’t win, I may have to pick up my own copy! I need one of those! Have a sweet little baby but simple meals are in desperate need! Plus, I LOVE cookbooks! This looks awesome and I’m feeling lucky! Don’t you live cookbooks with pretty pictures. Usually that is how I chose the cookbooks I buy! Cookbooks are just so pretty to look at, pick me please! Great prize!!! I would love to have it! I love cookbooks that have great photos with them! I love simple! Pick me! I’d love to win this! It looks great. Thanks! I love Real Simple as well as everyone else…pick me, pick me, PULEAZ! Thanks for the chance! Ten years? You have got to be kidding me. Are you sure that wasn’t just a couple of years ago? sigh. I love that magazine. I would be happy to win the cookbook. Wow– 10 years already? This is a great giveaway! Love Free anything, especially Simple things. Thanks for keeping Real Simple in business! 🙂 Looks like a great cookbook. Please, I love REal Simple! I made their meatloaf this week! I don’t usually purchase cookbooks because I get all my recipes off of food blogs, but everything else that you have recommended has worked great for me so far so I would love to give this a try! I’d LOVE to add this cookbook to my collection! This book this awesome! I’ve been needing some new dinner recipes! I LOVE simple recipes, would love to win this! maybe, maybe, maybe I’ll win this time!!! I love Real Simple. Looks like a great cookbook! It would be a pre-holiday treat to win! i just ordered this magazine for myself as a christmas gift–hey! you can’t start too soon, right? when i ordered it, i was wishing i could afford to get the cookbook too. maybe now i won’t have to worry about that! Always great photography in Real Simple. Count me in. Real Simple is my favorite magazine. I love it!! I like their style!! And yours, too, Jane! I love Real Simple! They are so classy! Real Simple is one of my favorite magazines as well! I’ve got lots of magazine pages with recipes from past issues in my kitchen and around the house! I’m so bored cooking dinner I can’t see straight. Maybe a new cookbook would liven things up, so please enter me to win. Thanks. I love their magazine, I am sure the book is awesome. I wanna win! I could really this! There are few things more fun than a new cookbook! I’m excited to check this one out. Pick me!! I love Real Simple! Oh! I am so excited! Thank you! I am always in need of new recipes…choose me! I’m in. I need more cookbooks and recipes. This cookbook looks great, I would love to get it. I have oogled many a Real Simple magazines…and would love the cookbook! oh my! That cookbook would certainly warm up our kitchen this winter! Yay! I love any and all cookbooks. It keeps our meals exciting and I LOVE simple! Looks like a great one! I love cookbooks. love their recipes. pick me! Great giveaway – and GREAT magazine! 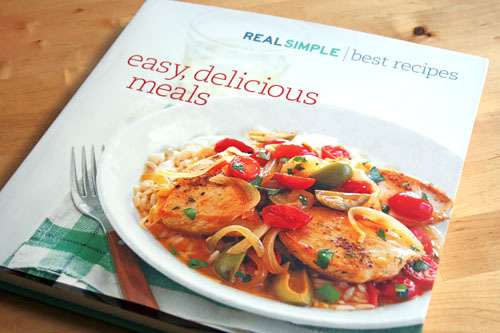 I LOVE Real Simple…would love to have the new cookbook!! I can never have too many recipe books! Here we go again!! A girl can never have too many cookbooks! LOVE, LOVE Real Simple. I want this!! I was just telling myself that I won’t need a new cookbook for a long time! Real Simple is the best. I agree about wanting to tell the world about Real Simple. The practicality of their articles astounds me every time! I’m crossing my fingers… I love Real Simple! Love Real Simple and would love this cookbook. Thanks! I’m an adorer of Real Simple. How was that for fabulous grammar? An adorer. I love Real Simple! This cookbook looks great. I hope I win!! hey, thanks for showing the random.org site. i wondered how to do those things! I am really into cooking lately and could use a few new fun easy recipes! YUM! And I’m sure Amy would love it to seeing as I cook and she eats it! I’m definitely in the mood for some new recipes! Bill Cosby is so funny! Also I think I should win. The current life style looks for more simplified versions of recipes and i am glad that i have really struck a good place. I love cookbooks! I would love to win this one!! Yum! I love Real Simple. Would love some Real Simple cooking. Thanks! Love Real Simple! Thanks for such a great give away! i love real simple! I’d love to win! I love real simple! They always have fresh new ideas! I LOVE Real Simple and would love the cookbook. Simple recipes are just what I need. I love Real Simple! There recipes are always so delicious! Real Simple is one of my favorite magazines. It would be great to have the cookbook, then I wouldn’t have to try and remember where I put that recipe that I pulled out of the magazine that I wanted to try! This cookbook looks fabulous!!! Would love to have it sitting by my other cookbooks at home! yeah! I would love, love, love this!! Great giveaway! I love real simple although I haven’t subscribed in a few years I still look back through old issues to find new things to cook. I would love one of their cook books. I LOVE real simple!! Thanks for this great giveaway! I love Real Simple, thanks for the chance to win! I love this Cookbook. Thanks Jane. This looks like a GREAT book!!! I could really use a little help in the meals department!! I’m all about cookbooks with pictures!! The pictures help me know the best way to fudge recipes. I love Real Simple and could definitely use these cookbooks! I recently spoke to an editor from Real Simple telling her I allow my self 1 magazine subscription a year. I try to mix things up a bit, but I always return to Real Simple. On the years I don’t subscribe, I usually end up buying my copies at the grocery store anyway. The recipes are wonderful and it’s exciting to hear that they have compiled them into a cookbook. I love Real Simple’s recipes. I would love to win this cookbook. Thank you for having this giveaway! I live on real simples website. Thanks for the great giveaway this cookbook would be a fabulous addition to my collection! Yah!! I love Real Simple and I know I will love this cookbook. Oh I could use a new cookbook! Winning this would be like an early Christmas gift!! who wouldn’t love a cookbook? I love Real Simple! I have been getting this magazine for over 2 years now. It really helps me get motivated and organized since I work full time and have 2 toddlers. I love Real Simple. My favorite recipe books are the ones with lots of pictures. I often don’t cook things unless I see them. I can’t wait to see this book. Oooouuuuuu with ALL the cooking I’ve been doing lately and menu planning; I’m trying at LEAST one new recipe a week. I would LOVE to devour this for ideas! I haven’t had a new recipe book in years, so I would be DEEEE lighted. Awesome giveaway. PICK ME PICK ME!!! I LOVE REAL SIMPLE AND COOKBOOKS!! perfect. I love Real Simple and their recipes! Comment 144….getting more competitive! Maybe this will inspire me to cook! I love Real Simple and I would LOVE a cookbook! I love Real Simple! Their new Real Simple Family is also really good. I’d love to win this cookbook :o) We need some variety in our kitchen! This would be a great addition to our kitchen:) Thanks for the chance! I need some new and delicious recipes. Would love to win! This would be an awesome book to win! I love Real Simple! I love Real Simple and would love to have this cookbook! Oh my. Please!!! I’m drooling. love real simple. i’ve been reading it forever and i’ve tried many a recipe. I’m in. My wife and I love the magazine. Oh what yummy delicious food I could make. my favorie magazine as well!! love the photography and the recipes! Wahoo! I can never get enough cook books with delicious recipes! Thank you Real Simple. I love this magazine too! I’ve kept every issue I’ve ever subcribed bc of all the great ideas and tips! I love Real Simple! One of the first recipes I cooked from your blog was the Real Simple lasagna and it’s still a staple in our house a couple years later! Ohh I would love this! Thanks! now that’s one cookbook I might actually use!!! Easy and delicious–what’s not to love! If I win this book, I could actually start cooking and give my wife a break! Love, love, love, Real Simple. Crossing my fingers. Real Simple… What could be better? I would love to win this one!!!! I also love Real Simple and love my cookbooks! A Real Simple Cookbook would be divine. This would be GREAT! I have two kids, work from home, and life couldn’t be busier. I need something SIMPLE! I love Real Simple magazine and they have some great and easy recipes. As a busy mom of three, I love when everything is real simple. I absolutely love Real Simple. Please let this cookbook be mine! Ohhh… pick me! pick me! I am completely addicted to Real Simple Magazine. I just moved into a new home and would love a new cookbook to go with my new kitchen!! Great Blog! Good simple recipes? I want this!!! Thanks for the great give-aways all the time! yes please! I love Real Simple! I think I’ve been reading Real Simple since the get go too! I love it! I look forward to reading it each month. I love Real Simple, and I don’t have any of their cookbooks. This would be great! Oh, I LOVE Real Simple and their recipes! I’ve been cutting them out for years, and they never let me down. If I was stranded on an island and had to pick one thing to take with me, it would be Real Simple. Honestly. I love real simple and I bet their cookbook has some great recipes that I would love to try. I’d love to win this! Real Simple and me have totally different world views and totally different budgets!..but I love reading their magazine! I’ve got some of my best ideas from there! pllllllllllleease let it be meeeeeeeeee! I love this magazine, and the cookbook would be wonderful! Love it! I love Real Simple and their recipes! I have to agree…Real Simple is the best…I have been subscribing to it for years and have every single copy downstairs waiting to be organized!! As I write you this comment there are 194 (nearly 200) folks already! Impressive- speaks well to Real Simple’s reach and quality. I just subscribed to Real Simple mainly for the recipes! This book would be a great xmas present for ME! I need some new simple recipes. Thanks for the chance to win this book. This book may be the one to take me away from the food doldrums I seem to be stuck in. Love the pics! I love Real Simple! I think this would be an awesome book to have. Already on my Christmas list, but I’d love to win it! I love REAL SIMPLE and I love good cookbooks…thanks for doing this! I need to learn to cook! I’d love to win one!! I would love to have anything helpful to make simple, delicious meals! I LOVE the magazine…I would love the cookbook too! My husband thinks I own too many cookbooks… as if that’s even a possibility. I love Real Simple. This would be great to win. I could so use a new cookbook! Maybe I’ll get lucky! Thanks! I love real simple! Pick me! I adore Real Simple Magazine & have been loving it for 10 plus years! I am totally addicted to cookbooks and this one looks to die for! Wishing and wishing some more that I am the lucky winner of what is sure to be a great cookbook! I love Real Simple. This cookbook looks great. I hope I win. I kinda feel out of the loop since I haven’t been a real simple follower for 10 years – but I guess I was in middle school 10 years ago 🙂 Maybe I can jump on this really fun sounding band wagon!! I love Real Simple! What a great giveaway! i have their chicken pot pie receipe-sooo good! Real Simple is really simple but good cooking especially for a busy family! Simple is what I like in cooking. Hope I win! I LOVE this magazine and the website is just as amazing. I would love a new cookbook. I am a big fan of Real Simple. love their magazines. and would love the cookbook! LOVE Real Simple and would love their cookbook even more! I love how Real Simple gives practical advice for people setting up a home =). An awesome magazine. I love Real Simple, I can actually make their recipes! Oh, please pick me! Pretty please! this could plan my meals for a year! Need a copy! Would love it! I NEED another cookbook. Simply lovely! As a busy mom of 3 little ones I could really use some serious cooking help! Just what I need another cook book, serious! It looks like the odds are against me, but I might as well throw my hat in the ring to win this lovely cookbook! Real Simple: Life made easier everyday. Genius. To win this beautiful Real Simple Cookbook would be awesome. A lot of my cookbooks became musty smelling from being in storage too long and I’d love, love, love this one. Thanks for the give-a-way! We’re finishing up a kitchen renovation and I’m itching to start cooking again. This would be great addition to my cookbook collection. I LOVE Real Simple and would LOVE their cookbook! I’m always looking for new cookbooks to feed my addiction! Thanks! Real Simple is awesome, and their recipes are the only ones that EVERYONE in my family actually likes! I am always on the lookout for a new GOOD cookbook! Pick me please; I would love to win this! Thanks! Oooh! Sounds amazing. Can’t wait to try!! I would love to win something just once!! A recipe book with simple meal plans. Count me in! I would love a new cookbook and real simple is just my style!! I hope you pick me! I LOVE to simplify!! I randomly pick up a copy of Real Simple while in line at the grocery and never regret getting it. I would love to have a copy of this cookbook! I see there is a section in this cookbook on 30-Minute Meals! My favorite kind of recipe–quick, easy, and delicious I’m sure, coming from Real Simple. I’d love to win a copy of this wonderful cookbook! Yummy! I would love to experience this cookbook! Oh I would love to win this!!! I’m in need of a good cookbook! Is #271 lucky? I sure hope so. I LOVE Real Simple! The cookbook looks like it would be stocked with all of the things I NEED to make for my family. Pleaseeee Pick me!! Im terrible in the kitchen!! Need serious help!! and if its REAL SIMPLE..must be FOR ME! Put me on the list – I like things real and simple too! I love Real Simple! I totally want this cookbook! Love that mag! so many good ideas! I’d love this early Christmas present! oh oh! pick me! pick me! Love their magazine, would LOVE their cookbook! Just in time for Christmas gifts!!! The only cookbooks I can ever use are the ones that have pictures..otherwise I have no clue in where I’m going when I’m cooking! It has to be real simple or it could get real scary over here. I’m a huge real simple fan and love their recipes! I love real simple’s recipes! Looks like a great cookbook!!! I love Real Simple and well. I bet the cookbook is great. I would love to win this! Looks like a great cookbook-I’d love to win! I need some simplicity in my life. Simple food is good food! i love simple things! They make my life complete! Yum! I love their recipes! Thanks! Could always use more simple recipes! love their recipes and their beautiful photography. Thanks! I always love finding new recipes . . . especially one’s that are simple yet delish! It’s sometimes hard to find recipes that my boys will like . . . or even try! Good luck everyone! Oh, I would love a new cookbook. I love perusing the pages looking for yummy, easy meals for my family. I am a collector of cookbooks, would love to have this one for my collection! Love Real Simple. I’ve been getting their magazine for about a year. I hope I get it as their recipes ROCK! I love Real Simple and their simple meals. I love Real Simple! I can’t wait to see this book! I have never had the chance to use this book, but now I must!!!! 🙂 Have the best day. TWO copies? Perfect! One for me, and another to my sister in college for Christmas! real simple is the only home magazine i read! this book looks wonderful! oooh, i so need help in finding simple meals, this would be perfect! Ooh! I love a good cookbook! I have discovered “spicy” foods myself. Kim Mercer is my daughter-in-law, and I am having her send you a copy of my book “Don’t be afraid of your food storage…just Dutch it!” Have fun learning to Dutch oven cook while using dried and canned foods. I haven’t seen Real Simple in years but know they have wonderful recipes. Would love to have the book. I heart Real Simple and how they make my life (especially delicious meals) REAL SIMPLE!! I would love to get my hands on the Real Simple cookbook to help me with my meals. Thank you! A coworker always talks about Real Simple recipes. I have been meaning to try a few. I love Real Simple as well. I actually subscribe to the magazine – great mag. Great Dish. thank you for sharing.